Every enterprise is a brownfield scenario. Many legacy devices, especially those used in commercial and industrial applications, tend to have long life-spans. Existing device/tech haystack, in an enterprise, makes up 85 percent of all devices (IMS research), all of which mostly run isolated applications. When new data networking capabilities come along – we don’t uproot our existing infrastructure and start all over again – we layer them on top of our existing networks, continuing to improve and enhance them as we go. This drives business transformation to optimize efficiency of old and new devices, prevent failures, and create new services. Transforming siloed IT/OT to unified digital enterprise. Here’s where ‘Internet of Enterprise’ provides the answer. But unfortunately, most IoT applications ship ‘one-size-fits-all’ solutions that lead to dead-end dashboards. They answer a predetermined set of questions, where going beyond what we’ve been given turns out to be a can of worms. Let’s say we have an IoT enablement application that assures to manage diesel generator(s). The application reads historical performance data of generated power, battery voltage, run hours, fuel level etc. But what if you’re to manage multiple diesel generators distributed demographically – like telecom base stations, cell towers, remote ATM sites – all of where DG plays a critical role of primary & backup power source. These assets are quite prone to instances of fuel leakage, maybe a cracked coolant pipe, or possibilities of even fuel theft. You’re to identify conditions that led to downtime, probably predict how often the failures are likely, drill down on parts/systems that fail most often, the manufacturer of these parts, the supplier that caused most issues, and all of this across varied periods of time. At this point, you will certainly require a platform that transforms traditional SCADA to IoT-enabled connected infrastructure. Keeping these exact pain points in mind, we’ve engineered ‘EdgeX’, a multi-vendor, multi-technology software agent. EdgeX is more than just a conventional agent, in which it enables real-time acquisition and blending of data within verticals and across a wide range of industries – thus, laying the groundwork to unified connected business. 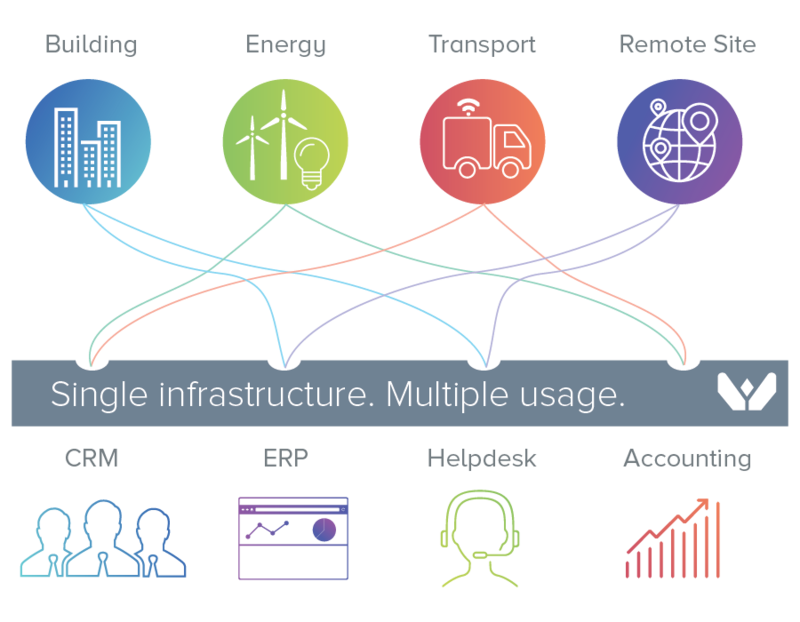 Likewise, enterprise IoT will allow building management systems (BMS) to evolve from just operating as unconnected systems. Instead, these systems will operate as part of a broader and smarter network. Buildings are incorporating lighting & power monitoring systems, water harvesting and HVAC equipment on the internet. These connected systems collect and analyze data enabling optimization of various operations of a building. Today’s BMSs are mostly proprietary solutions that can only be upgraded by the system manufacturer – a time-consuming and expensive pursuit. 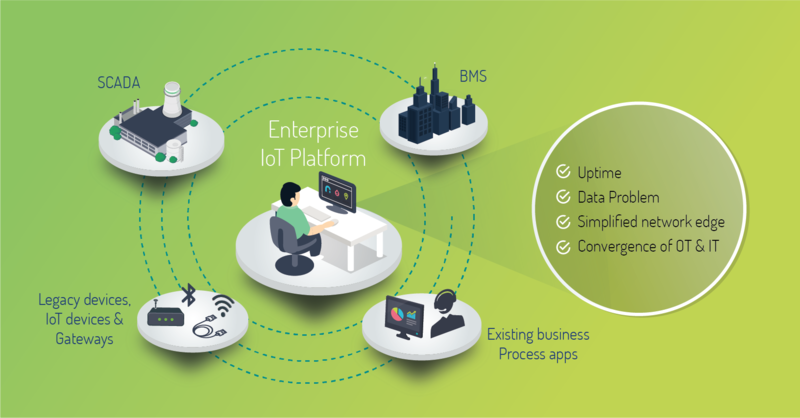 The transformation requires not only a technological shift, but a movement towards open business models that allows third-party providers to develop and integrate BMS with an IoT AEP platform. And with the case of platforms, there is no shortage there. Clearly, the number of platforms appears to be growing by the day and the competitive pressure in IoT software market is a lot heavier now than ever. Luckily, the internet isn’t just one network – a heterogenous mix of old protocols (likes of ethernet, wireless, radio, GSM, satellite, bluetooth) and new ones (likes of sensor networks, zigbee, sigfox, LoRaWAN, NFC and a whole lot more). This means devices must communicate with each other, device data needs to be collected and sent to server infrastructure for analysis, integration and sharing. All of this requires ‘data’ to be moved from point A to B.
IoT orchestration (legacy+IoT tech stack) requires clear-defined agent libraries to be set up for every individual device vendor and type. This is a lot of work from the standpoint of your IT staff or network engineer. Something as basic as a door sensor that sends digital signals has to be integrated into the platform as one use case and data from your staff’s ticketing app needs to be integrated for another use case. This very often needs a standardized communication interface to the platform. Here’s where WebNMS does the heavy lifting for high-volume, high-drill down usage across multiple enterprise verticals. What sounds simple is however not easily achievable and usually requires expertise and an enterprise-scale software framework. Sure you could use multiple pi projects and DIY apps but be prepared for massive efforts and laborious swivel-chair integrations. As far as enterprise IoT solutions are concerned – a platform that scales, unifies, and provides flexibility to integrate with existing IT/OT through open APIs, is pretty crucial. With EdgeX, powered by WebNMS Symphony IoT platform, you can establish a stable communication, acquire, analyse and gain insights from data across multi-vendor, multi-protocol and multi-vertical environment. If IoT is of interest to your business and you’re wondering how and where you start? Worry not! Come by booth 402 at IoT Evolution Expo in Las Vegas this July. Discover latest trends and innovation in Enterprise IoT and find out how WebNMS IoT can help your business transform into a digital enterprise.